Dhaka, 16 August, Abnews: A discussion meeting on evaluation report for 2016-2017 Fiscal Year of Annual Performance Agreement (APA) was held today (16 August 2017) at UGC Auditorium. Professor Dr. M. Shah Nowaz Ali, Member, UGC, was present on the occasion as the Chief Guest. Earlier, 37 public universities of the country signed Annual Performance Agreement for 2016-17 Fiscal Year with UGC for establishing good governance and excellence in higher educational institutions. 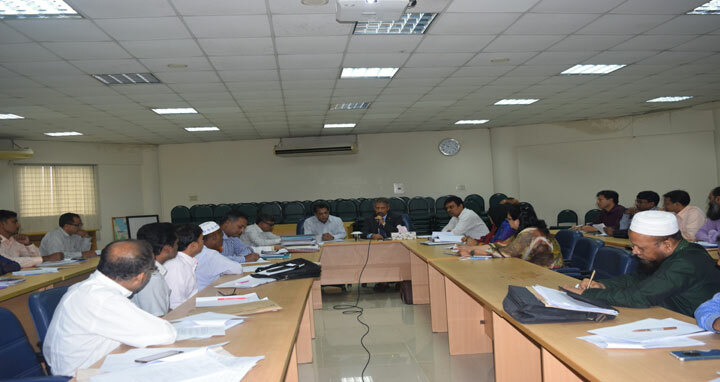 Addressing the programme, Professor Shah Nowaz Ali said that the present government has introduced Annual Performance Agreement to bring discipline and dynamism in activities among various government organizations. He urged all to come forward for working together for developing the nation and building a Sonar Bangla as dreamt by Father of the Nation Bangabandhu Sheikh Mujibur Rahman. Formation of Ethical Committee, Working Group and Core Committee of National Integration Strategy was also discussed in the meeting. Mr. Md. Mizanoor Rahman, FCMA, Director, Finance and Accounts Division, UGC and Mr. Md. Kamal Hossain, Additional Director, Strategic Planning, Quality Assurance & Right to Information Division, spoke on the occasion. Focal points of Annual Performance Agreement Evaluation Committee of 37 public universities took part in the meeting. High officials from UGC were also present in the meeting.